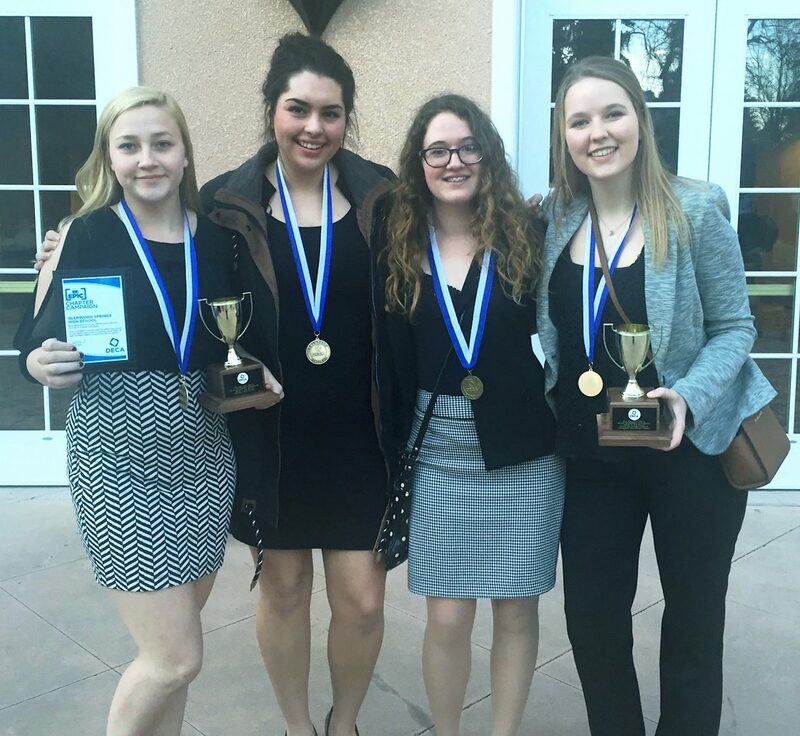 Glenwood Springs High School DECA Club members, from left, Mariah Hagan, Vanessa Davila, Kyla Rattin and Sara McCafferty, will be headed to the International Career Development Conference competition in Nashville, Tennessee, next month. Four Glenwood Springs High School students will be representing their school at the International Career Development Conference competition in Nashville, Tennessee, next month after placing at the state DECA meet in February. Vanessa Davila and Mariah Hagan took fourth place in their event, Hospitality and Tourism Team Decision Making, at the state competition that was held Feb. 21-23 in Colorado Springs. Sara McCafferty and Kyla Rattin placed sixth in that same event to earn a trip to nationals as well. It was the biggest event at the state conference, with 17 team finalists, according to team coach and teacher Taylor Parsons. Glenwood’s DECA chapter was also recognized at the awards ceremony as the top chapter in the district for completing several promotional campaigns to support the club, focusing on community service and giving to global efforts. The Glenwood chapter put together 25 shoe boxes for Operation Christmas Child, which sends Christmas presents to kids in Third World countries. Students also participated in the freerice.com campaign. “We also spent a day at (Colorado Animal Rescue), helping the staff clean the facilities and take care of some of the animals at the shelter,” Parsons said. Students also raised about $400 for the Wounded Warrior Project and wrote letters to soldiers who are stationed overseas, he said. As a result of that extra work to support the club, Parsons said he can take three additional students to the national conference to participate in workshops and chapter development activities. DECA stands for Distributive Education Clubs of America. Glenwood team members who took part at state included Emily Carrington, Abigail Cheney, Vanessa Davila, Michaela Fiore-Ruger, Kyah Green, Mariah Hagan, Cameron Horning, Lauren Howell, Hanica Lagiglia, Garrett Like, Sara McCafferty, Evelyn Nolasco Montes, Emily Page, Kyla Rattin, Eliette Rutledge, Leah Scholl, Mathew Townsley, Kendall Vanderhoof, Makena Warren and Mason Yellico.